China's national broadcaster, CCTV, has exposed a scam in which an official-sounding organisation known as the China Hospital Management Society has been selling hundreds of 'Top 10 Hospital' awards for 28,000 Yuan apiece. The expose on national television showed that the CHMS had made millions by 'selling' awards and it claimed to have connections with government bodies such as the National Health and Family Planning Commission. However these bodies have now issued a denial of any involvement and have called for a full investigation into the society and its fake awards. On its webpage (now unavailable) the CHMA claimed to be a non-profit public organisation operating under the auspices of the NHFPC and the Ministry of Civil Affairs. Just a few days ago the CHMA website was publicising the launch of its "2014 China Hospital Outstanding Manager Award" and also a "2014 Chinese Health Consumer Hospital Satisfaction and Trust Award". However, it did not say what the requirements or criteria for these awards were, only the closing date for nominations - April 8th. In January, the CHMA convened a conference in Beijing entitled the "2013 China Hospital Management Science Award Ceremony", the main purpose of which was to award participants with prizes and awards. The conference prospectus states that the society's honorary office bearers hold leadership positions in many important official bodies. Reporters verified these names and the fact that they attended the ceremony in question. A sponsor of the awards commented that these heavyweight leaders required payment of expenses to attend. The participation of these 'heavyweights" attracted many other organisations and individuals to attend the awards ceremony. According to the "Roll of Honour" there were 321 medals awarded. Administrative staff told CCTV that the awards organiser took in more than 10 million yuan per ceremony, and these awards have been offered twice a year for 4-5 years. 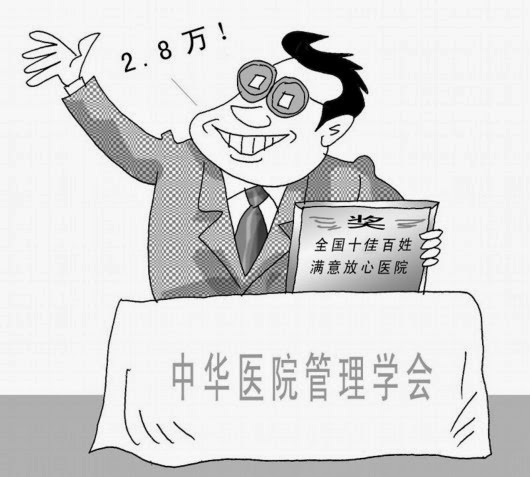 According to CCTV, participants who were willing to pay more could get more prestigious awards. Among the ten or so higher awards were the "All-China Top Ten People's Satisfaction and Trust Hospital" award and the "Top 10 Most Trusted Pharmaceutical Company" award. A CCTV reporter attempted to follow the process of such award by enrolling in the awards system. Despite missing the entry date he received an official confirmation letter, confirming that his 'hospital' had won a "Top 10" award. To collect the prize trophy, certificate and medal he was told he had to pay 28,000 yuan. There were about 300 participants in the awards of varying sizes. Some received one 'award' , others received several. The organiser said "if you say you are advanced you can be advanced, if you want to be outstanding, you can be outstanding, it can be rubber stamped if you pay more money." The CCTV report said some winners of the 'awards' auctioned them off to others. Those who bought the prizes said they had many uses, and could be put on display to fool the public. They said the ceremony allowed them to have their photos taken with the influential 'heavyweights' who were in charge of important departments and held high office, and would help them win tenders. Others said they bought many smaller awards for 4000 yuan at the ceremony and then sold them on to smaller subsidiary hospitals for a profit. The China Hospital Management Society claimed to be operating under the supervision of the NHFPC, but there is no record of it on the NHFPC website. The NHFPC announced that the CHMS was not linked in any way to the department and it was not a legitimate assessment or rating organisation. The department said all bodies that conducted assessments, ratings and commendations in healthcare had to strictly adhere to standards and supervision. The so-called CHMS awards for top hospitals and outstanding performance were all invalid, it declared. Editor's note: The CHMA appears to be a bogus version of the official Chinese Hospital Association whose website (cha.org.cn) and a list of genuine awards can be seen here. The CHA has published notices warning of the bogus CHMA.